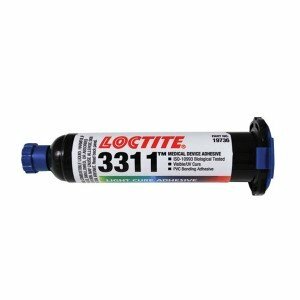 Loctite 3311 is a one component, low viscosity, UV cure, acrylic bond material. It is designed for bonding flexible or rigid PVC top polycarbonate while not introducing stress cracking under typical molded stress levels. This adhesive will enhance the load bearing and shock absorbing characteristics of the bond are while offering high speed curing for production. It is well suited for application with small gaps less than 0.25 mm. It offers outstanding adhesion to a wide variety of glass, plastic and metal substrates and is well suited to be used in the assembly of disposable medical devices. Loctite 3311 has a specific gravity of 1.1 at 25 degrees Celsius and a flash point of 77.2 degrees Celsius. The adhesive can be cured by exposure to UV or visible light that has sufficient intensity. To reach a full cure on surfaces exposed to air, radiation at 220 to 260 nm is required. Curing speed will be dependent on the UV intensity and spectral distribution of light source. Dielectric breakdown strength IEC, 60250 is 31kV/mm and the dielectric constant dissipation factor is 100 Hz 4.56/0.05. Before applying, substrates need to be clean and free from grease, dust, dirt and debris. It is recommended to dispense Loctite 3311 from applicators with black feedlines. The intensity for cure in bondline situation is 5mW/cm² with an exposure time of 4 to 5 times the fixture time at the same intensity. For dry curing of exposed surfaces a higher UV of 100mW/cm² is required. The bond should be allowed to cool before it is subjected to any service loads. For more information on the proper application of Loctite 3311, contact Krayden and a certified Technical Representative will assist you with any questions that you may have. The safe handling and the proper handling precautions need to be read on the Loctite 3311 MSDS before using the material. The product needs to be stored in a dry location in its unopened container. Optimal storage temperature is between 8 to 21 degrees Celsius. Temperatures about or below can affect the properties of the material. Once material is taken out of the container it is strongly recommended to not return the adhesive back to the container because it may be contaminated. 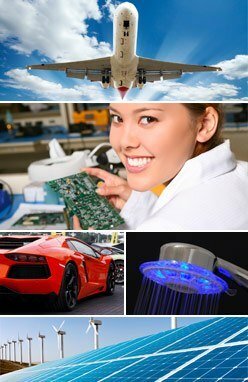 Loctite is an innovative company that strive to deliver cutting edge products for a wide variety of industries. They spend countless hours testing and developing state-of-the-art chemicals that are used to bond, seal, encapsulate and much more. Loctite 3311 is one of their many amazing products used for bonding flexible or rigid PVC to polycarbonate. It is well suited for small gaps in the assembly of disposable medical devices. For more information in regards to the sizing or application methods, contact Krayden, a certified distributor of Loctite products. Loctite 3311 Technical Data Sheet.